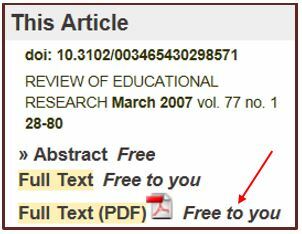 Last week’s Librarian blog was about finding a journal article by searching its DOI using the Library’s journal finder. But you can also use a search engine, such as Google or Bing, to find an article by its DOI. As discussed in last week’s blog, a DOI, or Digital Object Identifier, is a unique number given to an article to provide a persistent link to its location on the internet. The DOI is typically located on the first page of an article. You may search the DOI in Google, Bing or another search engine. For example, type DOI: 10.3102/003465430298571 in Google. takes you to the homepage of the Sage journal: Review of Educational Research. (Note “sagepub” in the URL.) Once there you will find the full text free! Remember: not all articles have a DOI and not all databases allow DOI searching.